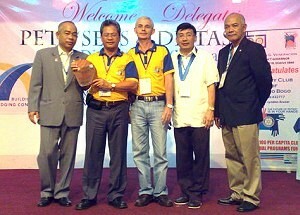 TACLOBAN CITY – The Rotary Club of Tacloban was adjudged the Most Outstanding Club in Philippine Rotary District 3860. District Governor Antonio Veneracion handed the award last May 16, 2010 during the Rotary District Assembly at Montebello Villa Hotel, Cebu City. Other major awards received by the club were: Most Outstanding President - Virgilio “Ben” Gaspay; Most Outstanding Secretary - Jean Marechaux; Most Oustanding Bulletin - Waray Waray; Most Outstanding Community Service Project; Outstanding Public Relations Project; and 31 Certificates of Recognition. Rotary Club awardees RC Tacloban president Ben Gaspay and secretary Jean Marechaux (2nd and 3rd from left respectively) with fellow Rotarians during the event. The club has been in service to the community for the past 62 years, being chartered on August 20, 1947. This Rotary Year 2009-2010 under the leadership of President Ben Gaspay, the club undertook a total of 143 community service projects to less fortunate beneficiaries involving water and sanitation, health and hunger, literacy, youth development, environmental protection, and others. Among the most notable projects were the 120-day full meal feeding to 103 malnourished pupils in Manlurip Elementary School; provision of sanitary toilets to fifty (50) households in Barangays Camansihay, Cabalawan, Apitong, Caibaan, and Nula-tula; 1,800 pieces of school bags to various public elementary schools; boxes upon boxes of books; installation of ten (10) jetmatic pumps in several barangays; 300 slippers to indigent schoolers; fifteen (15) thermal scanners donated to public elementary and high schools; eight (8) wheel chairs; various hospital equipment and medical supplies; medical missions; eye camps; 2,220 pieces of brand new dresses; and many more. TACLOBAN CITY – As rehabilitation work at the MacArthur Park Beach Resort Hotel is stalled, the provincial government of Leyte is giving the Singaporean-backed conglomerate LKY Property Holdings to finish the rehabilitation by October this year. However, Leyte Governor Carlos Jericho Petilla said during the recent Harampang ha PIA, he doubts works will be finished and meet up with the expected deadline. More likely, he said, the two parties, the province and the developer, may have to go back to discussing again the terms of the 25-year contract to rehabilitate and turn the property into a world-class hotel under a more or less P300 million investment. With the developer’s failure to finish up the job as agreed, the governor added, can be constituted as ‘breach of contract’. “That’s what we have to further discuss. We are giving them the deadline till October,” the governor said. He likewise disclosed partly the reason why rehabilitation works were stalled was that the same conglomerate is rehabilitating the Mayon Imperial Hotel in Legazpi City, Albay, another in Camarines Sur and has already invested in millions with the said projects. If the schedule was followed, Gov. Petilla said, by this time there should already have been villas erected while construction of the hotel’s main building was being expected to commence between July to September this year. “As it is now, I don’t think the schedule was followed and I doubt they could finish up on the date stated in our agreement,” Gov. Petilla said. With this situation, the province is already scouting for other interested and willing investors who can turn the property into a world-class hotel to entice more tourism activity into the province. To recall, the provincial government initiated the turn over of the hotel some years back before the Philippine Tourism Authority could declare it not to be earning enough revenue to continue operation. The hotel has not seen that much improvements under the PTA then because, as with other PTA-run hotels in the country, requests for materials for the hotel was centralized and takes time before the request is fully catered to. President Gloria Macapagal-Arroyo then directed the provincial government to take over the management and operations in January 2009, built by then First Lady Imelda Romualdez-Marcos in the town of Palo, Leyte, and sequestered by the government after the Edsa Revolution in 1986. The governor however remains optimistic that Leyte still remains as an alternative tourism destination, being a safe destination where people can relax. Considered a landmark in the province, Gov. Petilla said, the historic Mac Arthur Park Hotel can offer it all if it has all the needed facility to better its services and lure more tourists with better options. CATBALOGAN CITY – The Social Integration Program of the Arroyo administration awarded cash assistance to three former rebels from Leyte at the 8th Infantry Division camp Monday morning. In simple ceremonies with Commanding General Arthur Tabaquero, three former male rebels named Gerald Perez, former member of Mt. Amandewin Command who turned in one browning Automatic Rifle got a hefty sum of P50,000. 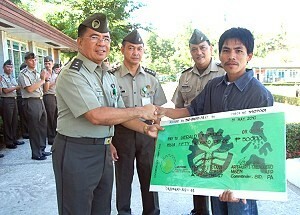 Another rebel, Angelito Remojo who turned in one caliber 5.56 M16 rifle also received fifty thousand grand. Still another, albeit only ten thousand pesos, was received by Francisco Teramo who turned in one caliber 30 M-2 carbine rifle. The trio admitted having received cash awards earlier from Governor Jericho Petilla of Leyte, right after they surrendered. Gerald, 27, who is from Ormoc City said that including the latest, his cash assistance has reached some P95,000. He told PIA he is tending a small business and he plans to use the money for additional capital. He said he reached only grade 3 but can read or write. He was convinced to join the armed group because of false promises, he added he had armed encounters with the government soldiers in Ormoc and Villaba, Leyte. He stayed in the movement for five years and surrendered n 2008. It was peer pressure that led him to the lairs of the rebel group. Unlike Gerald who can read and write the ‘visitors pass’ issued to PIA, Angelito claims he can’t read nor write and would just affix his thumbmark in documents. He aired his wish to become a member of the CAFGU. Mano Francing, 66 was the most senior, he said he has lost track of the number of years he spent as an NPA asset who tips the rebels of the army’s activities. He failed to tell PIA how he knew of the army’s operations. He also received the least amount - P10,000 only. But like the two younger ones, he said Petilla (Leyte Governor) has been giving them cash assistance in the past. The three are from Leyte province. MGen. Arthur Tabaquero in his message said he is always pleased with former rebels who are returning to the folds of government. NEW WESTMINSTER – Brandishing a placard that screamed: “Stop immigration fraud” and joining a small group of protesters led mostly by Indian immigrants along 76th Avenue in Surrey recently, Patricia Intrepido-Voigh sought for better regulation of immigration consultants from the federal government. Born in Polomolok, South Cotabato in the Philippines, Intrepido-Voight migrated to Canada and stayed in Ontario from 1989 to 1996 when she married a Canadian accountant she met while working as hotel clerk in Singapore in 1988. They transferred in British Columbia in 1997 where she operates a cleaning service. She bewailed that she already spent nearly $25,000 in “blood money” to certain immigration consultants to facilitate the papers of her brother and sister in Koronadal, Cotabato in the Philippines in vain. “They don’t have the decency to explain to me the chances of my brother and sister or if there is possibility that I could recover my money but they appeared so decent when they received my money,” Intrepido-Voigh protested. Protesters were demanding from the federal government that consultants be bonded and restricted from making false promises and guarantees. “Some unscrupulous consultants are taking advantage of the applicants’ desperation to obtain a visa in order to stay and work in Canada,” a fellow protester from Burnaby added. An immigrant lawyer has reported that Canada's immigration system has created "a recipe for disaster" and it's not surprising five people – including a senior immigration official – have been charged with corruption and fraud. According to Lorne Waldman, Canada's immigration system falls down in three key areas. "You create programs that create desperation – couple that with junior officials having a lot of power, and lack of supervision," he said. "Those three things together are a recipe for disaster." Despite being known as a country of bitterly cold weather, Canada is a country of choice among many Filipinos – both professional and skilled workers alike. Filipinos’ immigration to Canada has become a favorite topic nowadays among most of working age Filipino women and men, both in the Philippines and also those who were already working outside of the country. Statistics show that there are 700,000 new graduates yearly in the Philippines and these young people have nowhere to find a suitable employment after graduation. Many of them would work in call center agencies, many more will find temporary employment abroad but majority are thinking about immigration to Canada as their passport to a better future, it was reported. Intrepido-Voigh said despite her woes, she is not losing her hope to bring in her brother and sister, who are both computer literates. “I know that in the field of all possibilities, they we will survive here. We will soon be able to overcome this problem once the government has started regulating the (immigration) industry and separating the chaffs from the grain,” she concluded. PASAY CITY – Reelected Senator Pia S. Cayetano today scored the National Economic and Development Authority (NEDA) for blaming the newly signed Expanded Senior Citizens Act of 2010 (ESCA) for government’s revenue losses and to justify new tax measures, including raising the Value Added Tax (VAT) rate from 12 to 15 percent. “The outgoing administration should stop using our senior citizens as its escape goat for the shortcomings of our revenue collection agencies. This tack is not only baseless, but also unfair,” said Cayetano, principal sponsor of Republic Act 9994 which exempts senior citizens from paying the 12% VAT. Cayetano was reacting to a statement by NEDA Director for Policy and Planning Dennis Arroyo who said that the gains of the 12 percent VAT were wiped out by recent laws that granted tax relief, including ESCA and the exemption of minimum wage earners from income tax. She noted that RA 9994 was signed into law last February 16 and won’t take full effect until after its IRR is finalized and published next month. “But what’s even more disturbing and unacceptable is (NEDA’s) use of our senior citizens to justify hiking the VAT rate from 12 percent and 15 percent,” stressed Cayetano, who has an economics degree from the University of the Philippines. Instead of blaming the elderly and minimum wage earners, Cayetano urged the government to just focus on improving tax collection efficiency, citing its inability to collect P115.9 billion in potential tax and non-tax revenues last year, which contributed to the ballooning budget deficit which hit P198.5 billion by the end of 2009. TACLOBAN CITY – The An Waray Party-List is among the 28 winning party-list organization which have been proclaimed by the Comelec on May 31. This means that An Waray Representatives Bembem Noel and Neil Montejo will have another three-year stint in Congress. Both Representatives Noel and Montejo are from Eastern Visayas. An Waray is the winning party-list group in Eastern Visayas. The An Waray party-list garnered 711,631 votes, getting the 7th highest party-list votes during the May 10 automated elections. This qualified the An Waray to claim two seats in the House of Representatives. The Party-list System Act (Republic Act 7941) provides that those who received at least two percent of the total votes cast for the party-list system shall be entitled to one congressional seat each while those who received more than two percent of the votes shall be entitled to additional seats in proportion to their total number of votes. However, each party-list organization shall not be awarded more than three seats in Congress. The Comelec has yet to receive all the votes cast for the party-list system, specifically from areas where there were failure of elections. Included in these areas are seven municipalities of Lanao del Sur, two municipalities of Basilan, and one municipality of Sarangani - where special polls have been scheduled on June 3. The 1987 Philippine Constitution provides that 20 percent of the seats in Congress be allotted for the sectoral representatives. Ang Kasangga sa Kaunlaran, Inc. (Ang Kasangga) - 296,368 votes (1 seat); Bagong Henerasyon (BH) - 292,875 votes (1 seat); Ang Galing Pinoy (AGP) - 269,009 votes (1 seat); Agbiag! Timpuyog Ilocano, Inc. (AGBIAG) - 262,298 votes (1 seat); Puwersa ng Bayaning Atleta (PBA) - 238,675 votes (1 seat); Arts Business and Science Professionals - 257,301 votes (1 seat); Trade Union Congress of the Philippines (TUCP) - 244,623 votes (1 seat); Alyansa ng mga Grupong Haligi ng Agham at Teknolohiya Para sa Mamayan, Inc. (AGHAM) - 241,898 votes (1 seat); Democratic Independent Workers Association (DIWA) Kapatiran ng mga Nakulong na Walang Sala - 234,717 votes (1 seat); Kalinga Advocacy for Social Empowermennt and Nation Building Through Easing Poverty, Inc. (Kalinga) - 229,198 votes (1 seat); Alagad Party-list - 227,116 votes (1 seat); 1 Ang Pamilya - 217,032 votes (1 seat); Alliance of Volunteer Educators - 214,760 (1 seat). The proclamation of 11 party-list groups which have pending disqualification cases filed against them or their nominees were deferred. CALBAYOG CITY – While Buenos Aires constituents are enthusiastic to cast their votes on June 3, 2010 special elections, Pagsanghan Election Officer Renato Gaditano revealed that no formal resolution yet was received by his office for the holding of said activity. He also said that even election paraphernalia such as PCOs machines and official ballots are not yet delivered. Gaditano clarified that he only received a text message from COMELEC Regional Director Atty. Nick Mendros but the central office has not yet issued any resolution in his office. To avoid cast of doubts from either party, he would opt to postpone the activity should there be no paraphernalia and guidelines delivered on the specific date. 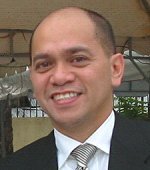 Gaditano added that pressures are but normally experienced by him but he would ensure that his duties and functions are lawfully implemented in order to attain an honest, orderly, peaceful and credible elections as this would be the deciding factor to declare a new set of officials that would run the municipality of Pagsanghan. Talking about the transport of voters to nearby towns and provinces, as long as there is no formal complaint filed in his office, aspirants/politicians are not in any way violating such provision of the Omnibus Election Code. With respect to the composition of BEIs and poll clerks, he affirmed that no changes have been made and the COMELEC would still follow the recommendations given by the Department of Education. He however rectified that the number of registered voters based on their record is 492. The Local Civil Registry has not yet transmitted any communication for the deceased persons in order for them to update the voting population of said barangay. He finally clarified that the figures are still the same; and it would be the responsibility of poll watchers from both parties to check and monitor the persons that would cast votes on election day. TACLOBAN CITY – In keeping with its thrust of providing its members with responsive benefits, treatment for colon cancer, the third leading cause of cancer deaths in the Philippines is now being covered by PhilHealth. There are risk factors for developing colon and rectal cancer: increasing age, smoking, family history of colon or rectal cancers, high-fat diet and/or a diet mostly from animal sources, and personal or family history of polyps or colorectal cancer. Appropriate colorectal screening leading to the detection and removal of precancerous growths is the only way to prevent this disease. A colonoscopy may be performed and a biopsy may be obtained to confirm that the abnormality is a cancer. Routine blood tests are also needed. Treatment for colorectal cancer depends on the stage of the cancer. It can be curable when caught at its early stages. Surgery remains the primary treatment while chemotherapy and/or radiotherapy may be recommended depending on the individual patient’s staging and other medical factors. PhilHealth covers surgeries as treatment for colorectal cancer. Preoperative tests and procedures are also covered for planned or elective surgeries, subject to existing rules and regulations. PhilHealth covers colonoscopy and biopsy procedures for colorectal screening. Benefit claims even for outpatient hospital admissions for these procedures may be filed. Inpatient and outpatient chemotherapy and/or radiotherapy treatments, including drugs and supplies with purchase date of not more than 30 days prior to the procedure may also be reimbursed. Meanwhile, PhilHealth members who will undergo myomectomy and hysterectomy are also covered by PhilHealth. The procedure falls under Case Type B category, hence members confined in a Level 3 (tertiary) hospital may avail themselves of up to P500 per day for room and board fees; P14,000 for drugs and medicines for a single period of confinement; P10,500 for x-ray and other laboratory examinations; P4,000 for operating room fee; and doctor’s fees of P11,200 and P4,480 for OB-Gyne and anesthesiologist, respectively. Furthermore, blood transfusion done for outpatient basis is now being paid for by the state run PhilHealth, through Circular 51 series of 2009 which took effect on all claims for outpatient blood transfusions starting February 1, 2010. In a statement, PhilHealth said that it has recognized the fact that there are illnesses that require blood transfusion but do not necessarily require confinement of at least 24 hours. Members and their qualified dependents shall be entitled to these benefits provided that they have the qualifying contributions and that the procedure is done in duly accredited hospitals anywhere in the country. TACLOBAN CITY – The period from May 28 to June 12 of each year is declared as Flag Days to awaken or rather reawaken the good citizen in every Filipino, possessing values such as love of country, respect for the Flag and elders, patriotism, nationalism. During this period, all offices, agencies and instrumentalities of government, business establishments, institutions of learning and private home are enjoined to display the flag. More so, this is a good opportunity to remind each and every Filipino that the Philippine flag is the symbol of sovereignty and unity among the Filipino people, reverence and respect for the Flag and the National Anthem is therefore, called for. The National Historical Institute has issued guidelines on the proper use of and allegiance to the Philippine Flag, with several prohibitions. Canned music, for one, is banned during flag ceremonies or programs. The use of tattered or badly faced flags in all schools and offices is also prohibited. Filipinos are admonished never to mutilate, deface, or trample the flag. Also prohibited are such acts as using the flag as a drapery, table cloth, covering for wall, among others. The flag must not also be worn as a costume or uniform; neither must the flag be printed or attached on handkerchiefs, napkins or as display of any advertisement or info commercial. Perhaps it is also good to be reminded that at the moment the first note of the anthem is heard during a flag ceremony, everyone in the premises shall come to attention; moving vehicles must stop. All persons present shall place their right palms over their chests, those with hats shall uncover; while those in military, scouting security guard and citizens military training uniforms shall give the salute prescribed by their regulations. It would be good to re-read Republic Act No. 8491 known as the "Flag and Heraldic Code of the Philippines," which provides that reverence and respect shall at all times be accorded the flag, the anthem, and other national symbols which embody the national ideals and traditions and which express the principles of sovereignty and national solidarity. Everything one needs to know on according reverence and respect to the Flag is contained there. Perhaps the most important thing to remember is that the Philippine Flag is the symbol of the country's freedom and independence. Each and every Filipino must ensure that it continues to fly up there, free to move and dance as it is kissed by the blowing wind.